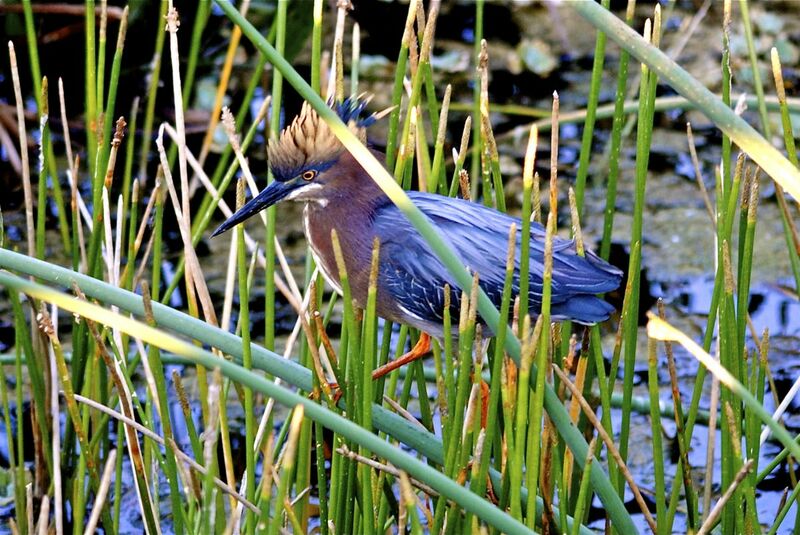 Green Heron, photographed at Green Cay Nature Center in Boynton Beach, Palm Beach County. First thing about the green heron, Butorides virescens, it isn’t all that obviously green. Blues, yes. Browns and reds, certainly. Whites and even yellows, check. But green? In the right light and at the right angle, the green becomes apparent. In any regard, greens are common in and near Florida's wet habitats, marshes, ponds, lakes and rivers. 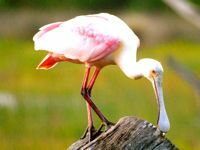 They are year-round residents of the Sunshine State, as they are in other areas along the Gulf and Southeastern Atlantic coasts. They're also found in California. They'll visit areas inland as far north as Canada in summer. 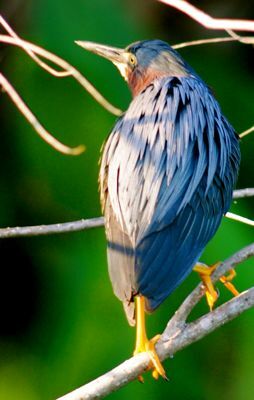 Greens are small herons, going about a foot-and-a-half long, with a wingspan of about two feet. They are darkly plumed birds; the species that most closely resembles greens is the least bitern, but they're more of a light brown and tend to have their heads cocked upward. Greens have long necks, like other herons, but they're usually scrunched in except when flying or attempting to catch dinner. Green are frequently spotted along the water's edge, sometimes perched in vegetation just above, perfectly still, waiting for a morsel to pass by. 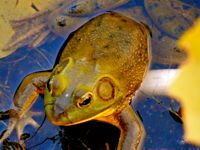 They dine on fish, crustaceans and other aquatic delights, and insects. Occasionally, they'll take a frog, a lizard or a mouse. Greens also will stalk the shallows in search of food and on occasion, will dive into deep water after a meal. They hunt during the day and at night. 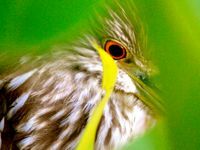 The Cornell Laboratory of Ornithology notes that greens are one of the few birds to use tools — they'll take a stick or a blade of grass and use it to lure small fish. They nest near or over water in trees or shrubs, in places concealed them from a multitude of predators. 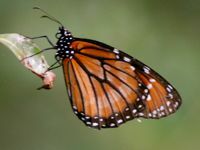 Males start construction before selecting a mate. Once hitched, he relinguishes most of the assembly work to the female while gathering most of the material. A pair will have one or two broods a year, each with three to five eggs, which will require three weeks, give or take, to hatch. The offspring will remain nest-boud for two to three weeks more, and may stay with their parents for a month after fledging. Both parents care for the brood. 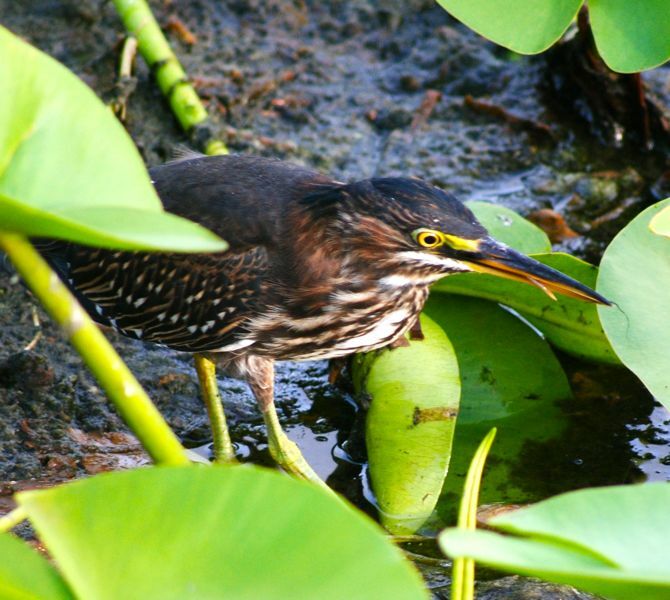 The green heron population is healthy enough to rate a "least concern" from the International Union for Conservation of Nature. However, green numbers have been in decline in most of their range. 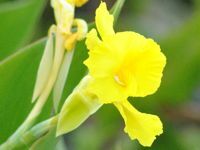 The major threat is loss of habitat. 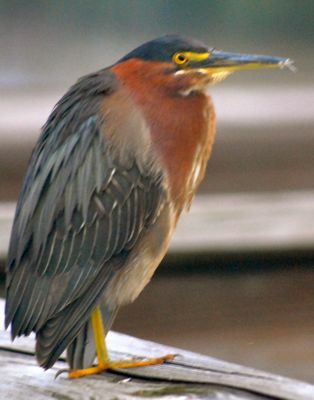 Green herons are members of Ardeidae, the heron family.